A SYRIAN refugee told the city council he was living in fear just days before a frenzied knife attack left him fighting for his life, it has emerged. Shabaz Ali’s solicitor called for an immediate review of homeless accommodation after blaming the council’s inaction for putting his client in danger. Teenage thug Sean Gorman, 18, yesterday admitted racially abusing and stabbing Mr Ali six times at a Bruntsfield hostel on May 3. Housing chiefs stressed they were taking the safety of residents in temporary accommodation seriously and that a review will take place next month. A statement issued by leading human rights lawyer Aamer Anwar on behalf of Mr Ali and his family said: “Shabaz is extremely lucky to be alive, but even when he was placed in the hostel, he states that only days before being stabbed he raised concerns for his safety with Edinburgh City Council. “There must be an urgent review by Edinburgh City Council of the placement of refugees and other vulnerable people in homeless accommodation. Mr Ali, 25, had fled to Edinburgh five years ago with his family after nine relatives were butchered in their home city by Islamic State. He was working as a barber and staying in the Upper Gilmore Place hostel with his female cousin Malak as he looked for a new home. His family told how Mr Ali stepped in to stop his cousin from being racially abused and was then threatened by Gorman. Mr Ali was to work in the morning and had tried to ask the attacker and his friends to turn down their music. Gorman made threats and racially abused Mr Ali before stabbing him and fleeing into the street. He was traced a short time later in Duff Street and arrested, with a lock knife recovered. 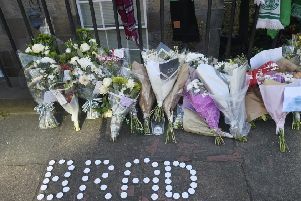 Gorman pled guilty to the racially-aggravated attempted murder of Mr Ali, as well as causing racially aggravated alarm to Malak at the High Court in Edinburgh yesterday. Mr Ali is now understood to face multiple operations to walk again, as well as being left emotionally traumatised by the sickening attack. More than £12,000 was raised by campaigners for Mr Ali, an aspiring engineering student, to rebuild his life. Gorman will be sentenced next month. City housing convener Kate Campbell said officers sought to house vulnerable people in the “most appropriate” accommodation and provide support.